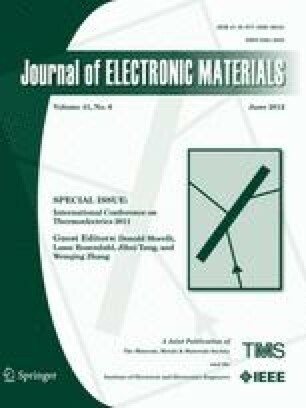 We demonstrated the fabrication of thin-film thermoelectric generators and evaluated their generation properties using solar light as a thermal source. Thin-film elements of Bi0.5Sb1.5Te3 (p-type) and Bi2Te2.7Se0.3 (n-type), which were patterned using the lift-off technique, were deposited on glass substrates using radiofrequency magnetron sputtering. After annealing at 300°C, the average Seebeck coefficients of p- and n-type films were 150 μV/K and −104 μV/K, respectively, at 50°C to 75°C. A cylindrical lens was used to focus solar light to a line shape onto the hot side of the thin-film thermoelectric module with 15 p–n junctions. The minimum width of line-shaped solar light was 0.8 mm with solar concentration of 12.5 suns. We studied the properties of thermoelectric modules with different-sized p–n junctions on the hot side, and obtained maximum open voltage and power values of 140 mV and 0.7 μW, respectively, for a module with 0.5-mm p–n junctions. The conversion efficiency was 8.75 × 10−4%, which was approximately equal to the value estimated by the finite-element method.